October 26, 2017 — In a world now flush with Halloween programming, there are still really only two Halloween “specials.” And which one of those you favor says, well, absolutely nothing about you other than that you like Halloween. 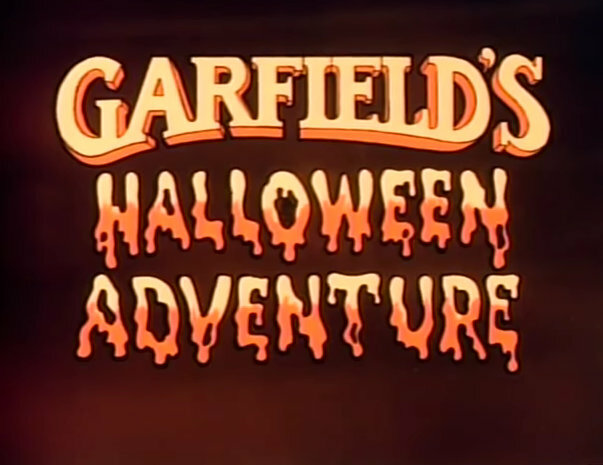 And while I must give extensive and sincere props to It’s the Great Pumpkin, Charlie Brown for doing it and doing it well for more than 50 years, I’m on Team Garfield’s Halloween Adventure. Maybe it’s because an orange and black cat as round as a pumpkin is a perfect mascot for the holiday. Maybe it’s because too much of Charlie Brown is spent on the Red Baron segment. 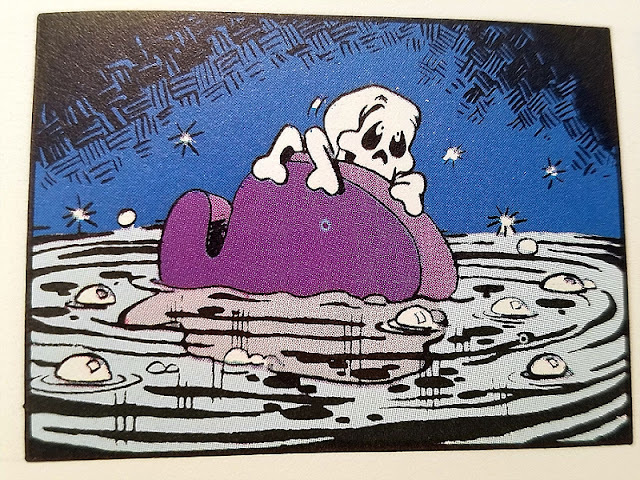 Maybe it’s because, like Ray Bradbury himself observed, not seeing the Great Pumpkin at the end of the Charlie Brown special is kind of a rip-off. Most probably, it’s because Garfield’s Halloween Adventure gets spooky. And Halloween without spooky is a mere harvest party. At some point, I picked up the book based on the special. Although, since they both came out in 1985, “based on,” might not be the right terminology. 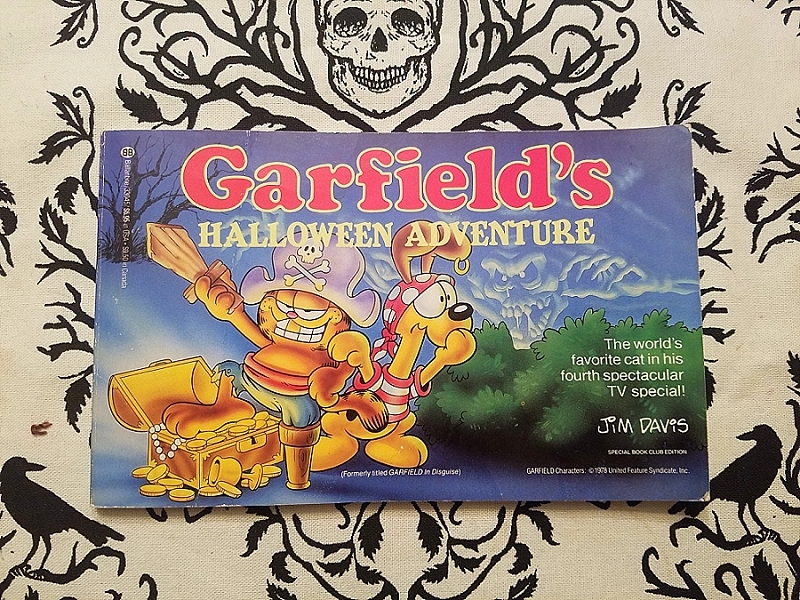 My version is a book club edition, so it has the Garfield’s Halloween Adventure title instead of the original and gawdawful title Garfield in Disguise, which by itself would have knocked the special down below It’s Not Really the Great Pumpkin, Charlie Brown. Realizing that I hadn’t done a comparison essay since, like, Freshman English, I thought I’d sit down with the book and the special and compare the two stories. All I was missing was a pirate hat and a wooden sword. Why don’t I have those things? 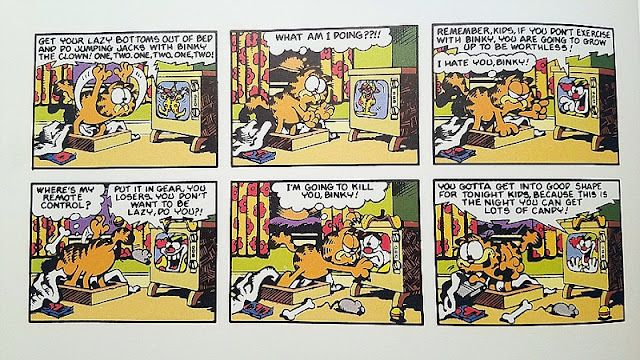 What’s immediately apparent (well, if you’ve been watching the special once a year for the past three decades like me) is that both rely on the exact same script, almost to the comma. And that the blocking of the characters is the same. It’s the details that are different—the props and colors and backgrounds and look of the minor characters. 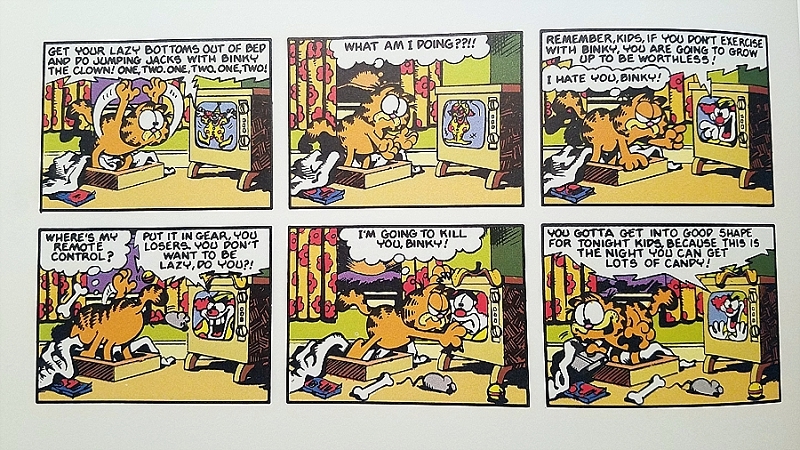 You can tell they were slightly separate interpretations by Jim Davis on the same script direction. An interesting script change does happen in the first scene. After Binky the Clown “Heeeeyyyy, kiiiiiiids!!!!! 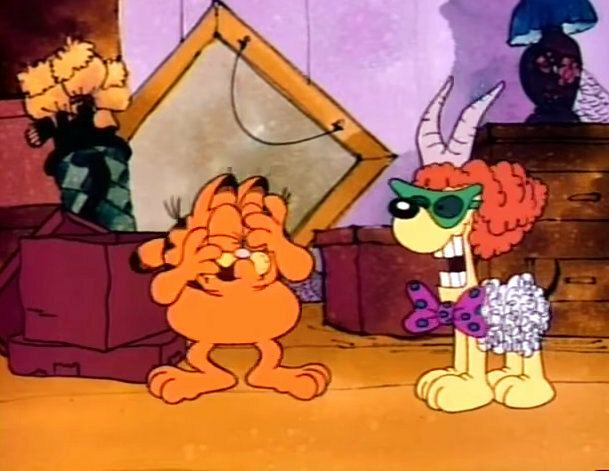 !” Garfield awake in the special, Garfield tells Binky that he hates him. 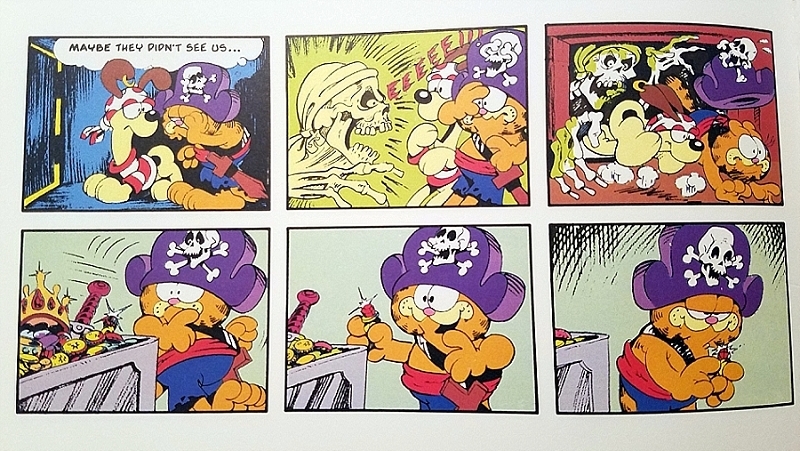 In the book, he doubles down with, “I’m going to kill you, Binky!” Perhaps Standards and Practices thought death threats wouldn’t play well for a children’s special. Or maybe the creators just though it was redundant with the other line. Other minor changes include more exposition in the book around why Garfield and Odie cross the river; the pirate flashback is illustrated in the special, but not in the book; and when Garfield and Odie lose the boat in the special, it’s because the old man takes it. 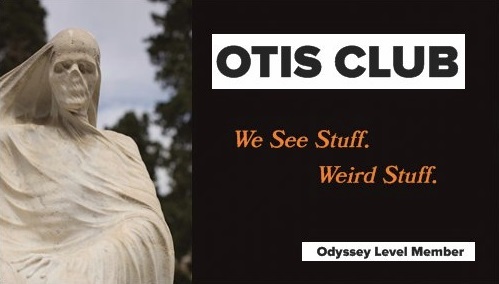 In the book, it floats away on its own…with all that candy, candy, candy, candy, candy. Now, let’s get to the more interesting changes. Like the fact that, in the book, the skull and crossbones on Garfield’s pirate hat is almost a character, reacting in fear or bravado or delight just as Garfield does. 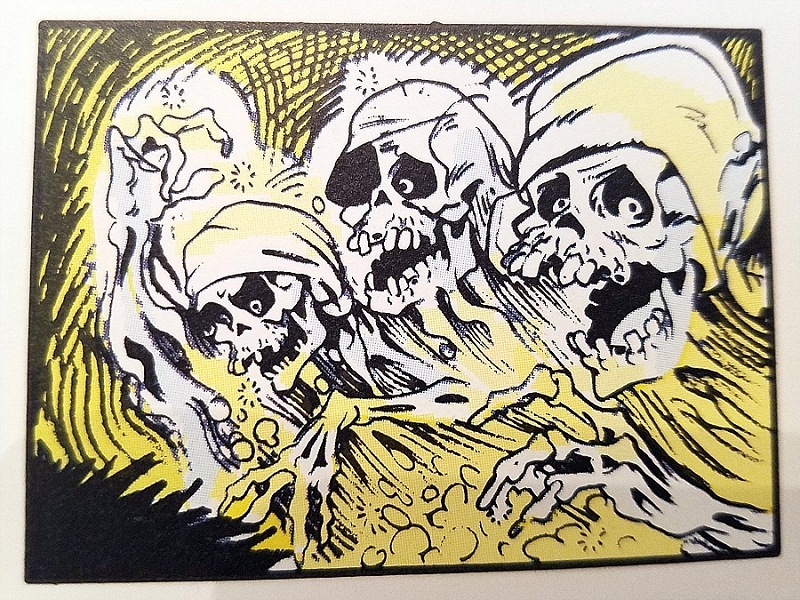 It even clings to the hat with its cross-bones during the drowning sequence. The only time it’s animated in the special is when Odie and Garfield freak out at first seeing the old man. Animation is expensive. 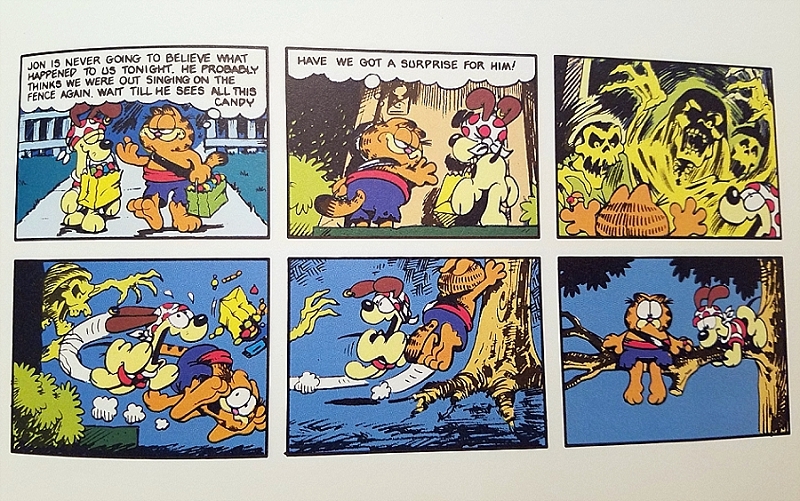 Another big difference between the stories happens when Garfield and Odie go trick-or-treating. In the special, Garfield tries to calm Odie’s fear of all the diminutive monsters running around with sacks in their hands. 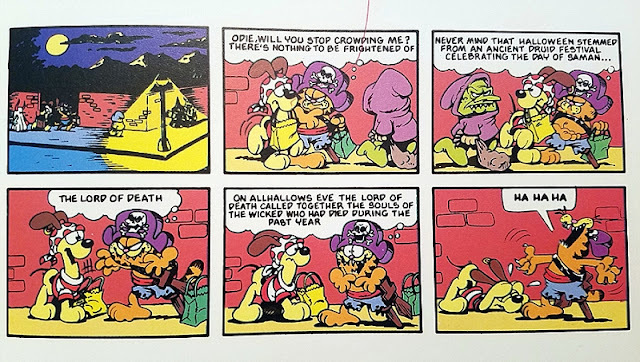 In the book, he first scares Odie even more by telling him the origin story of Halloween. Garfield actually uses terms like Druid and Samhain and Lord of Death, all the while his fangs and claws slowly come out until his monologue ends in a maniacal laugh. I’m way bummed this scene didn’t make it into the special. 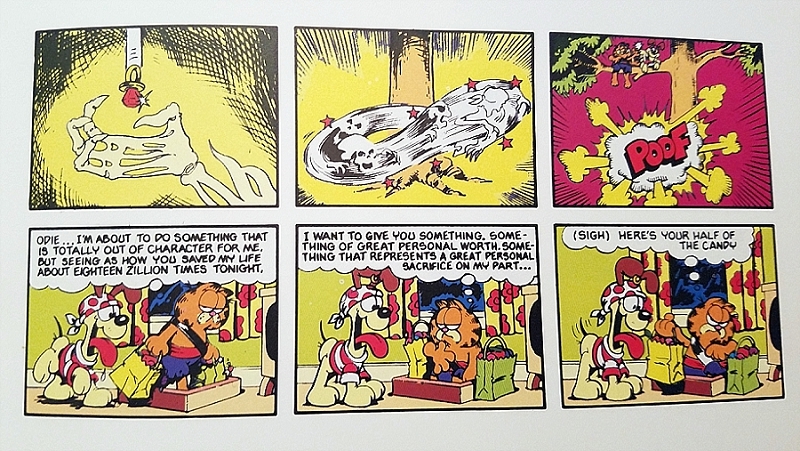 Would’ve rivaled Linus’s explanation about the meaning of Christmas. 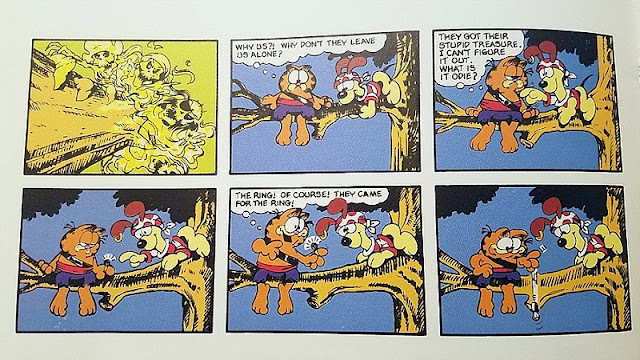 You can also tell this was removed because Garfield’s says Odie saved him “18 zillion times tonight.” In the special, he saves him once, from drowning. In the book, twice, from drowning and from the pirate ghosts who want their ring back. Actually, that line doesn’t make sense either way. It’s a good edit. 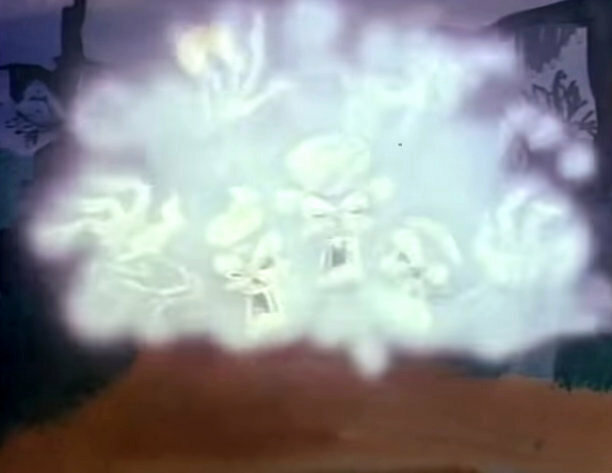 As much as I like the ghost pirates coming back, the reason they do so is hackneyed, and I like that the supernatural elements of the story are confined to that spooky island, disconnected from the real world as if it were an eternal spot of Halloween. 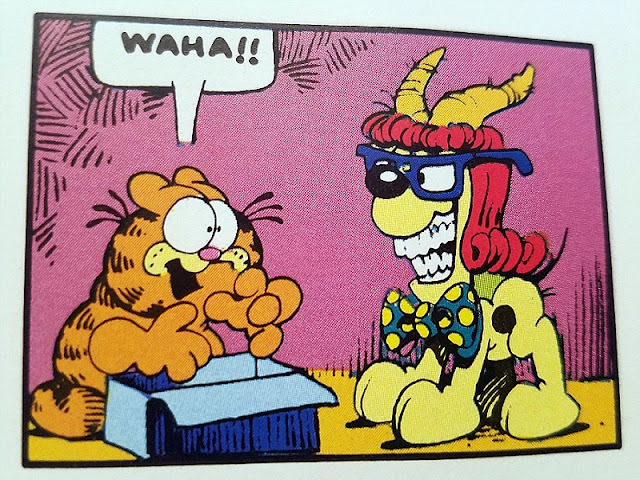 Like Garfield’s Halloween Adventure itself.